Air Force sources said 17 F-22s—one of the military's most advanced stealth fighter jets—were unable to fly away to avoid the Category 4 storm and were damaged in hangars at the base that were not built to withstand major hurricanes. Most of the stay-behind aircraft, including F-22s QF-16 target drones and Mu-2 aircraft trainers, sustained some damage and several were destroyed when Hurricane Michael came ashore near the base on the Oct. 10. A few of the F-22s were undamaged, the sources said. Despite having five days to assess the damage, the Air Force would not say how many of its frontline fighters were damaged. An Air Force spokeswoman declined to comment on the status of F-22s. "We don't have that information at the moment," she said. Defense Secretary Jim Mattis said on Monday that the air base "took significant damage." Many aircraft were able to fly out but "others that were there took damage in some cases," he told reporters traveling with him on a trip to Vietnam. An initial review by the Air Force indicates that it "looks like all the planes are fixable." "But we'll know after we get them out of the hangars that are damaged and get more work done," Mattis said. "So I'm not ready to say it can all be fixed, but our initial review was perhaps more positive than I anticipated in light of the amount of damage." A total of 55 F-22s were based at Tyndall and most were flown to safer locations before the storm made a direct hit on the base. The 17 jets that remained at the base were stored in hangars that were not built to withstand Category 4 storms. The base was built on a strip of land off the coast of the Florida panhandle a few miles south of Panama City Beach. Photos published on the internet after the storm showed at least two damaged F-22s inside aircraft hangars. The images showed aircraft hangars with roofs torn off and partially collapsed. 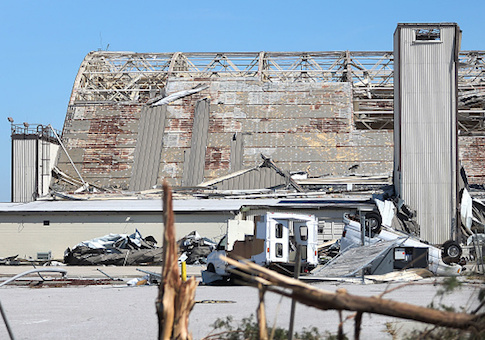 One source said the F-22s could not be secured because the short timeline of Hurricane Michael growing from a Category 2 to a Category 4 storm. "The hangars were not built to withstand a Cat 4+ hurricane—another cost-saving measure," the source said. The jets cost around $150 million each, and when research and development costs of the F-22 over nearly 25 years since 1986 are factored in, the cost of the aircraft could be as high as $330 million. In a statement Sunday night, the Air Force said Air Force Secretary Heather A. Wilson and Air Force Chief of Staff Gen. David L. Goldfein visited the air base. "Not one airman or family member was injured during Hurricane Michael," Wilson and Goldfein said. "As we drove through the base and assessed the damage, it was clear that the hurricane's toll was severe in places, especially around the Tyndall flightline," they added. "We also looked into each of the hangars that housed aircraft which weathered the storm for maintenance or safety reasons." "Visually, they were all intact and looked much better than expected considering the surrounding damage to some structures." Base officials are conducting a "detailed assessment of the F-22 Raptors and other aircraft before we can say with certainty that damaged aircraft can be repaired and sent back into the skies," Wilson and Goldfein said. "However, damage was less than we feared and preliminary indications are promising." The loss of frontline F-22 aircraft in Florida could impact U.S. military capabilities needed to deter a conflict with China. For the first time in decades, the Trump administration identified China as a significant strategic competitor in a new national security strategy and new defense strategy. The F-22 was built in the early 2000s specifically for a future conflict with China. But the aircraft was canceled during the administration of President Barack Obama by then-Defense Secretary Robert Gates who in 2010 capped the number of aircraft produced at 187 jets and closed the production line. Costs to reopen production and produce 194 F-22s were estimated by the Air Force in 2017 to be around $10 billion. The Air Force initially announced it needed 381 F-22s, which have unique capabilities for a future conflict with China. However, the Obama administration and Gates saw no need for large numbers of fifth-generation stealth fighters because the Pentagon was solely focused on equipping military forces to battle terrorists—not nation states. Gates defended the decision on the F-22 in his book, Duty, as a cost-cutting measure. "It was an exquisite aircraft designed primarily to take on other fifth-generation aircraft (presumably Chinese) in air-to-air combat and penetrate and suppress sophisticated air defenses," Gates wrote. "But we had been at war for 10 years, and the plane had not flown a single combat mission." Gates said he disagreed with F-22 supporters. "Even in the event of a conflict with China, where we were going to base a short-range aircraft like the F-22," he stated. "Did its defenders think the Chinese wouldn't destroy bases in Japan and elsewhere launching U.S. warplanes against them? All that said, one couldn't quarrel when pilots said it was the best fighter in the world." The F-22 is equipped with a capability called supercruise that allows it to fly long distances, through fortified Chinese air defenses, and fire long-range missiles while having enough fuel to return to regional bases. The decision to kill the F-22 in favor of producing the F-35—a jet produced in three versions that has been plagued with cost overruns—has been criticized by some national security professionals. "What a tragedy that Secretary of Defense Robert Gates' blind arrogance allowed him to cancel the F-22 production line on Obama's watch," said William C. Triplett II, former chief Republican counsel to the Senate Foreign Relations Committee. "The Chinese have had fifth-generation fighters in actual production since last year," he said. "Who advised Gates that they wouldn't even have one test flying until 2020? Every F-22 destroyed is literally irreplaceable, thanks to Gate's error." Triplett also criticized the former administration of Bill Clinton for building the F-22s most important base at Tyndall—"a sand spit in the middle of hurricane alley." "It could have easily have been put at Hill AFB in Utah or Nellis in Utah where they don't have hurricanes," he said. A former senior defense official said the full order of 381 F-22s was a validated military requirement that should have been fulfilled. The former official blamed "the failure of Bob Gates and [Department of Defense] to understand that ‘readiness' is directly related to spares." "Due to budget pressures, the military has adopted civilian logistics techniques such as ‘just in time delivery' to minimize costs—when it comes time for high end combat that approach will collapse and so will our combat capacity," he said. "The DoD has to stop confusing business efficiency with combat capacity." Budget cuts under the Obama administration have resulted in the F-22 fleet having the lowest rates of aircraft readiness for jets. The F-22 force is currently reported to have 50 percent of its aircraft mission capable. Air Force Magazine reported that a Facebook page known as Air Force Forum included a post from a member of the 43rd Fighter Squadron. "Four 43d F-22s were left behind to ride out the hurricane," the post stated. "One of them was scheduled to leave but GABed [ground aborted] after an issue prior to taxi. The other three were jets that couldn't be spun up in time to fly." Two other F-22s had been used for spare parts and other jets could not be repaired in time to fly. Tyndall is a major training base for F-22 pilots to learn and practice flying the aircraft. Col. Brian S. Laidlaw, commander of the 325th fighter wing, said in a letter to Tyndall airmen posted on the base's website on Monday that initial recovery of the base has been completed. "The focus of Phase 2 is to get you back into your homes to inspect and gather your belongings," he said. "Please understand that our base and local area remain dangerous. We are still cleaning roads, power lines and debris." The military blog The War Zone reported that F-22s require frequent maintenance and servicing that includes inspections involving disassembly of aircraft components and flight tests before jets can be returned to active status. "In other words, many of these operations are not ones you can simply stop and reverse to rapidly generate the aircraft into a flying condition in a matter of a day or two—in some cases, not even close," the blog stated. This entry was posted in National Security and tagged Military. Bookmark the permalink.